In the race to save native plants like purple New England aster and fragrant American mountain mint, the Chicago Botanic Garden freezes seeds for future use—but will frozen seeds be able to grow after hundreds of years in storage? Researchers are trying to find out. Environmental threats such as climate change have caused thousands of plants to become rare or endangered. The tallgrass prairie, which has lost 96 percent of its land to agriculture and other human activities, is one of the earth’s most endangered habitats. By preserving seeds in the Garden’s Dixon National Tallgrass Prairie Seed Bank, researchers are working to ensure that native species don’t disappear in the wild. Inside the seed vault at the Dixon National Tallgrass Prairie Seed Bank. 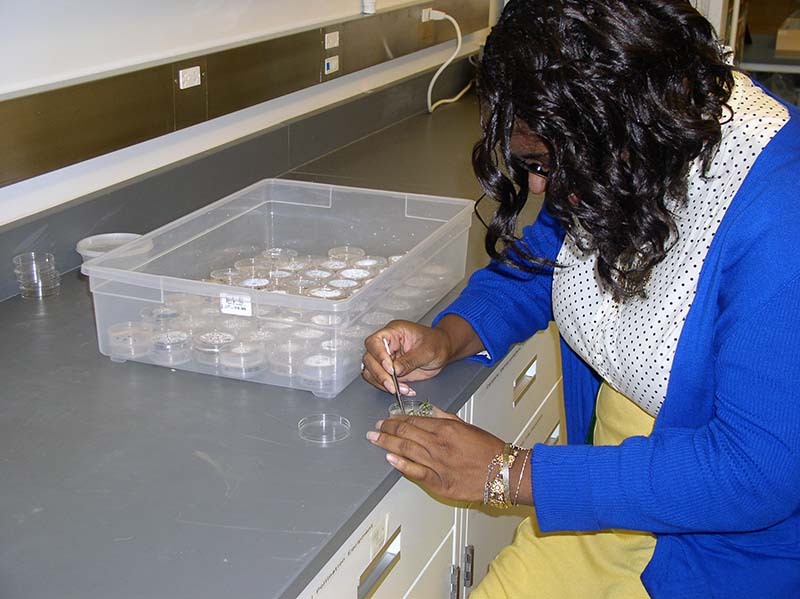 In winter 2015–16, two students from the Garden’s graduate program, which is offered in collaboration with Northwestern University, helped with the Seed Bank’s first germination trials. In the trial, a sampling of our oldest seeds was removed from deep freeze—a vault at minus 4 degrees Fahrenheit—and placed in favorable growing conditions to see if they would germinate after 13 years of dormancy. 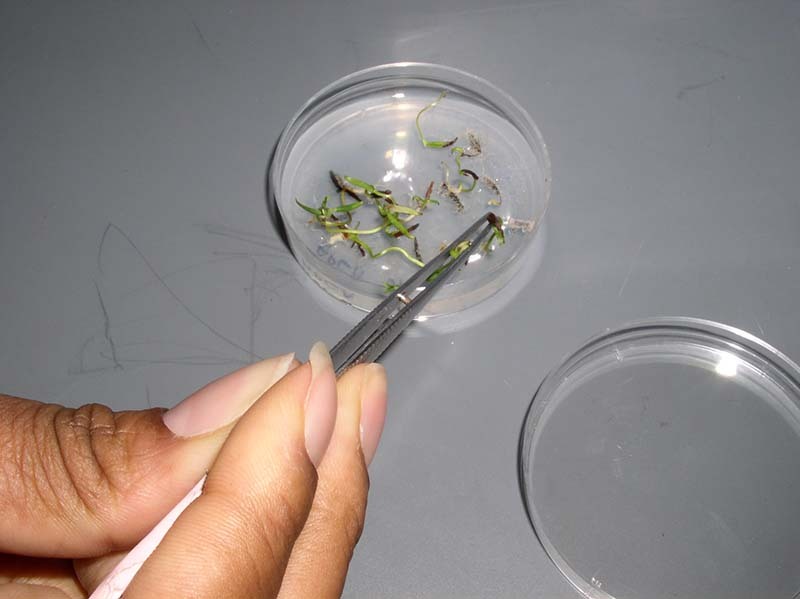 …and removing seeds that have germinated on an agar medium. The results? Species such as New England aster (Symphyotrichum novae-angliae), water speedwell (Veronica comosa), and American mountain mint (Pycnanthemum virginianum) germinated well. Species such as enchanter’s nightshade (Circaea lutetiana) and New Jersey tea (Ceanothus americanus) did not germinate; more research is needed to determine whether these seeds did not germinate because we were unable to figure out how to break their dormancy. Seed sample sizes for trial were either 24, 60, or 75 seeds, depending on the number of seeds in the collection. The results show that seed collection is an efficient and cost-effective way to preserve biodiversity for future generations; experts predict that many of our native seed can survive hundreds of years in a seed bank (we’ll repeat the germination test in another ten years). Meanwhile, if you’re interested in joining our team and helping with the critical work of seed collection or banking, contact us. Download/read the full results here: Germinating Native Seeds from the Dixon National Tallgrass Prairie Seed Bank.